For Fire, Ambulance, or Police Emergency call 911. Borden’s police services are provided by the RCMP from Warman, Martensville, Delisle and Radisson detachments. Ambulance service is dispatched from Saskatoon. Borden’s First Responders are well trained and look after persons in need until an ambulance arrives. Fire and rescue services are provided by a volunteer fire brigade. 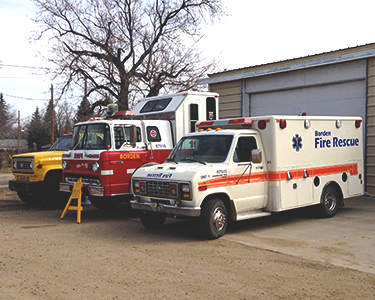 The Borden & District Fire Department serves the community of Borden and of the surrounding R.M. of Great Bend. Its members conduct regular training sessions and are equipped with a pumper unit, tanker unit, quick-response unit and jaws-of-life rescue system. The 18 member crew is trained to deal with fires and vehicle accidents. We service the R.M. 's of Great Bend, Mayfield and Redberry. We have mutual aide agreements with the towns of Radisson, Langham and RM's of Mayfield, Redberry and Corman Park. Members of the fire and emergency response crew receive training on an ongoing basis. They also participate in fundraising events as needed. The nature of fire and vehicular emergencies requires many trained people, so new volunteers are always encouraged.